Is visiting Antarctica on your bucket list but you’re not sure how to get there? It’s true, Antarctica is not an easy place to travel to, few people have travelled there compared to other destinations in the world but increasing numbers of travellers are making the journey as access opens up through expedition cruises. Here we discuss the ins and outs of Antarctica. When is a good time to visit Antarctica? Anytime between mid-November and early March as this is “summer” meaning slightly less ice and more active and visible wildlife for you to see (and the sight is worth it!). The majority of travellers go as a part of an organized expedition cruise. A typical itinerary will see you begin and end your cruise in Ushuaia, Argentina. Generally the minimum time is 2 weeks and can last several weeks depending on how long you want to travel for. 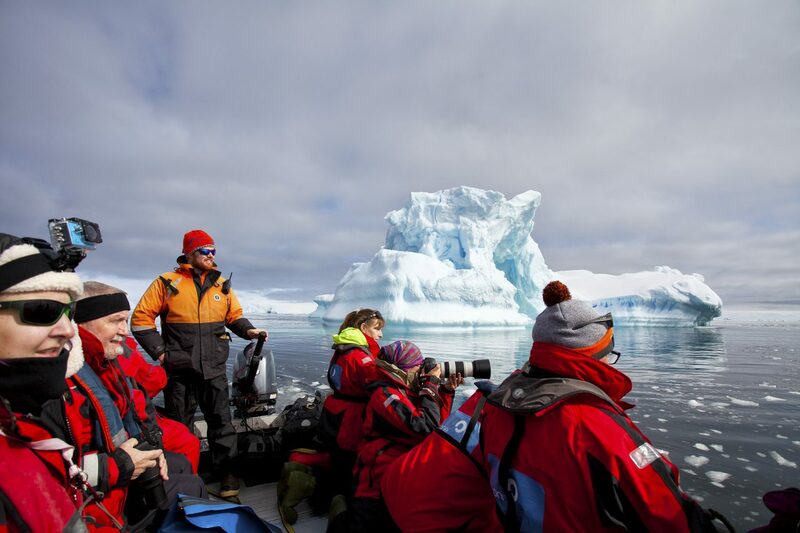 Travel Just 4U creates Antarctica itineraries for travellers from anywhere in Australia. They have reputable and proven expeditions they can recommend. Allow for a minimum of 2-3 weeks for the Antarctica journey. Travel Just 4U can recommend other places to see and visit in Argentina and Chile before and after your Antarctica cruise. They will also book the connecting flights to and from South America and any internal connections required. What can I expect from the Expedition Cruise? The expedition cruises range from basis to luxurious and most will visit the Antarctic Peninsula. You will find on these expedition cruises, experts from all around the world studying or just curious about wildlife and ice! While on board, there is opportunity to access WIFI in public access spots and make calls. Ushuaia, Argentina is an ideal gateway for you to explore the southern extent of Patagonia while preparing for your adventure ahead. Get active in the mountains or enjoy some hand crafted chocolate at a café in town. The expedition cruise will cross The Beagle Channel into the vastness of the Southern Ocean. The next land sighting will be along the Antarctic Peninsula. Named after the famed ship in which Charles Darwin voyaged, the channel presents many great photo opportunities to capture sea birds hovering overhead. The channel crossing takes 3 – 4 days so you can use this time to learn and educate yourself on Antarctica topics ranging from environment, safety procedures, and history, whaling and past expeditions. As you approach Antarctica on around Day 5 make sure your camera is fully charged. Not only are the icebergs majestic and plentiful you’ll be waiting for that once in a lifetime opportunity to photograph a whales spout or tail in Antarctica! There are opportunities on some expedition cruises to disembark and set foot on one of the most majestic and picturesque continents inaccessible to many. Despite the fact more travelers are making the journey to Antarctica, it is still one of the least visited places in the world. Where you disembark is dictated by the weather conditions. However no matter where you disembark you will find natural wildlife and habitat, including penguins as you’ve never seen them before, seals, the cracking and crumbling sounds of icebergs and glaciers and of course whale watching. It is important to remember that you are travelling to one of the most remote and weather inclement places in the world. A great deal of patience, flexibility and understanding is needed. Tour operators and the expedition crew will put the safety of yourself and your fellow passengers first. Therefore where you disembark may not always reflect your itinerary. There are nearly 200 recognized sites in the Antarctic Peninsula and South Shetlands and if the location does change, rest assured it will be equally as interesting. mended to travel with a recognised and proven tour operator and for insurance purposes, make sure you book this trip with a local Australia travel agent who can liaise on your behalf if needed when you are away. You do need to be conscious that this is an adventure to Antarctica. You are on sea and at times weather conditions may not be so favourable and extreme. Provided the tour operator is organised and equipped to handle extreme conditions, Antarctica trips are generally regarded as safe. Is there an environmental impact of me visiting Antarctica? Tourism anywhere into a natural habitat such as Antarctica will always have an impact. However, tour operators and Governments around the world have measures in place to assist in the sustainable travel to Antarctica. Simple measures include, not entering wildlife protected areas, not disturbing scientific activities, leave only footprints and take nothing with you, and restrictions on the number of people who should be ashore at a time. Guides will also accompany you to shore. By visiting Antarctica you will come to appreciate just have special it is and the absolute need for its protection. For more information on planning your journey to Antarctica contact the team at Travel Just 4U.